The stock market has had an nightmare roller coaster ride during the past 2 weeks that this week saw one of the best days of the year for the Dow (Wednesday +275) immediately followed by the worst day of the year (-335) the effect of which is to literally grind the strength out of the stocks bull market rally of 2014 with stomach churning moves that have been encouraging the perma-bears to literally scream at the top of their lungs that this time, THIS TIME the bull market really is over! Which has been regurgitated at length by the mainstream media and BlogosFear backed by supporting reasons coalescing around expectations that the U.S. Fed is to bring QE to an end this month and signal that interest rate hikes are just around the corner, all of this despite the FACT that stocks actually do quite nicely during the early years of a RATE hiking cycles! In fact its rate CUTS that stocks bulls need to worry about for they signal WEAKNESS ahead. Then there’s China weakness, Europe recession, ISIS and not forgetting EBOLA! So plenty of doom for the bears to play pick and mix with for reasons why End Time is here! In the real world my automatic response to people asking me about what’s happening to the stock market is "It's October, this is what always happens in October before we get the Santa rally ". So I approach this analysis from calm measured matter of fact point of view of being in an October correction, no doom panic here, well apart from Ebola consequences! Basically I just want to arrive at what is actually the most probable outcome so that I can both protect my wealth and make some money, which is to test my hypothesis for the duration of the past 5.5 years of this stocks bull market that CONSISTENTLY in over 300 articles and several ebook’s that there has been NO sign that the stocks bull market's end has ever been imminent since its birth in March 2009 (), and therefore all that has been necessary thus far has been a very simple strategy that most I inform cannot get their heads around for they want something infinitely more complex, and that is one of BUYING the deviation from the high.
" The Greater the deviation from the stock market high then the Greater the Buying Opportunity Presented". Clearly market participants are realising that the QE easy money looks like its coming to an end this month and that signals interest rates to soon start to rise and thus the stock market is evaluating and discounting all of the potential drivers of trend, many of which which on face value are not looking so good such as Europe once more teetering on the brink of recession and China experiencing an economic slowdown and then there is the growing economic impact of Ebola. Waves of bearishness have been washing over the mainstream media that predominately at least 80% of the time remains obsessed by BAD news, for FEAR SELLS! be it Islamic State, literally created by the CIA in the deserts of Libya in 2011 (remember CIA and British agents were wandering around the Libyan desert with suitcases full of dollars looking for Jihadists to recruit against Gaddaffi Duck). Be it China with its Hong Kong crisis. Or what will turn out to be the real threat of 2014 - EBOLA ! Where 1/100th of the amount being spent on bombing the Islamic state midges is being spent on halting a Pandemic that has killed over 3,000 people with the number infected looking set to snowball from 8,000 towards what ? to 1 million by January 2015? Yes, 1 million is increasingly looking PROBABLE! that's what happens with exponential inflation trends that double every few weeks! So its no wonder that many market participants are running scared as the impression given by the mainstream and the BlogosFear is that stocks have already been more or less decimated as the media only tends to focus on the big down days and not on any subsequent strong UP days. Not to pick on any particular analyst, just that Harry Dent shared his dire stock market warnings recently in - Stock Market Dow Jones Today Shows Warning Signs. That’s why selling pressure is not as high as it could be here in the final stages of this great bubble. This could be the secret indicator that does not flash as clear or bright a sell signal. Even the smart money tends to miss it at first. We’ll see. We don’t know when that final grain of sand will drop — but it’ll create an avalanche when it does drop. Bubbles don’t correct, they crash! We continue to advise that it’s better to get out a bit early than too late. I still see very little upside from here and a huge downside of a possible 65% drop on this Megaphone Pattern. 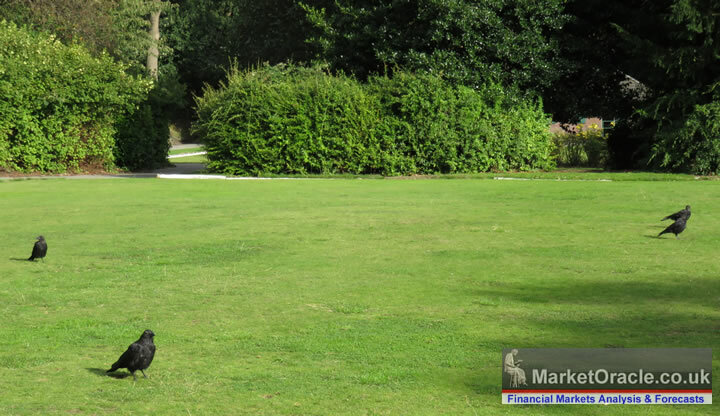 Be warned and have the courage to act decisively… protect your assets! Looking at the same chart through my own perception which is born out of pain and gain rather than academia or journalism. I see two key things, first a series of clearly defined trending significant bull and bear markets that collectively comprise a high volatility trading range, so the market has been exhibiting high volatility. And secondly an 15 year exponential inflation and technologically wealth creating coiled spring that is ultimately being primed to propel the stock market to the next higher equilibrium level, just as occurred during previous similar periods such as the 1930's and 1970's. The bottom line is that you do not want to see very stable price patterns for the stock or any other speculative market. You want the pattern to be marginal to be near 50/50, because most people tend to opt for what is easiest to perceive, much as everyone experiences gravity that pulls everything down to the ground, but instead what everyone fails to comprehend (including scientists) is that gravity is pushing everything away from everything else which is THE universal mega-trend - INFLATION and not just that but that the Inflation Mega-trend is EXPONENTIAL! While it could be argued that we will soon find out whether Harry's broadening top actually materialises or not. Unfortunately my response was written on 3rd of Feb 2013 in response to the SAME broadening top mantra! That’s 20 months ago! And as included in the Stocks Stealth Bull Market 2013 and Beyond Ebook of Feb 2013 (FREE DOWNLOAD), and given that we have reached October 2014 with many wondering if the bull market is now about to end then the Stocks Stealth Bull Market has definitely gone well beyond 2013! Worse still the broadening stock top expectation stretches further back in time (see Bloomberg video dated 31st Dec 2011 with the forecast for 2012). "I think the S&P 500 Is going to go down 30% to 50% in 2012 alone and I don't think that will be the bottom. This is going to be a replay of 2008 to early 2009 over the next year or two." So what many expected to start in May now starts in June which implies a relatively minor correction with the main one to come along later when the stock market has better set itself up for such a deeper correction that takes it Down during September and into Mid October, but that's for a future in-depth analysis. The August new high would set the scene for the real downtrend to begin into the seasonally weakest months of the year, but more on that in my next in-depth analysis. The actual subsequent new all time high came a little later than expected into Mid September following which the Dow on cue has entered into its seasonally weakest period of the year and the REAL down-trend has clearly begun. Therefore this analysis will now seek to answer the question is this just the anticipated October correction or is this time really the end of the stocks bull market? Whilst President Obola has been busy stoking up a hornets nest of angry jihadists in Syria and Iraq vowing revenge for the U.S. military Industrial complexes bombing of the self professed Islamic State, meanwhile the Ebola virus continuous its out of control rampage across West Africa with now over 20,000 infected and more than 4,000 highly infectious dead bodies, a number of whom of have been left on the streets to rot that amount to instant bio-weapons for the angry revenge seeking jihadists which could be used to wreak havoc across whole nations never mind individual cities as armies of infected jihadists embark on their Ebola suicide missions. This on top of the already growing risks of 'natural' exponentially doubling outbreaks every few weeks. Those that automatically dismiss this as just scaremongering need to realise that this is about as low tech as suicidal terror tactics go as no combat training or concealed explosives are necessary to achieve terror on a scale of the 9/11 attacks or even worse given the risk of multiple global outbreaks all for the cost of a few airline tickets, given the ease of delivery via the worlds air port hubs, which risks sparking outbreaks in many of the worlds major cities within days of one another. Clearly given the announced military response of countries such as the UK and US who under the banner of sending medical aid have begun to urgently send several thousand ground troops so as to secure the infected in camps and permanently dispose of the infected dead bodies. 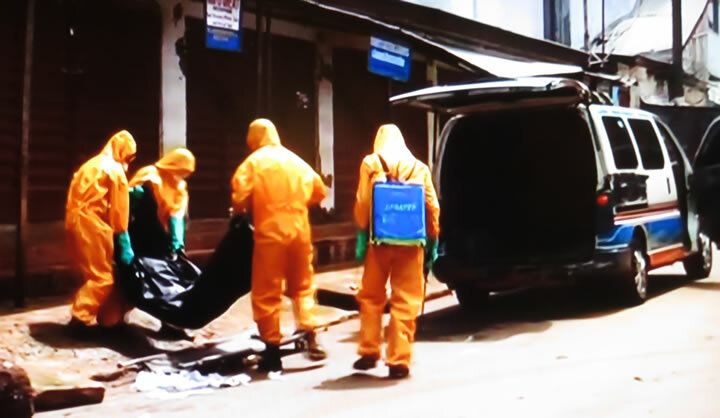 Nevertheless the threat remains that the various disparate jihadist movements throughout the region will through little cost procure infected bodies that they would then use as the source for an global Ebola terror campaign as all it would take is one infected jihadist returning to their country of origin to spark nationwide epidemics running in the thousands. Apparently the only hope for the West in preventing a Ebola suicide attack is for the jihadists screwing it up and killing themselves before they can deliver their biological weapon, which I am sure will happen in the initial attempts but the problem is that the Ebola terrorists would not even need to make it back to the likes of the UK, US, Europe for they have a ready pool of many thousands of refugees seeking to migrate out of the war zones right across the globe with literally hundreds of thousands in refugee camps bordering Syria and Iraq that would prove ideal breading grounds for the virus. Clearly President Obola and his French and British poodles have gravely miscalculated (as usual) by picking the worst possible time to on on the offensive against ISIS, they should have either done it far earlier in the year or waited until AFTER the virus had been brought under control, not at precisely the worst possible point in time for encouraging revenge attacks on the West by the ISIS death cult, just at the point when they have maximum potential to access instant bio-weapons just a plane ride away. Meanwhile Britains NHS are doing everything in there means to ensure an Ebola outbreak in the UK would soon become widespread by instead of concentrating the infected in an centralised facility away from densely populated areas instead they have adopted the exact opposite strategy for having the infected as widely spread as possible by disbursing Ebola infected persons to hospitals situated right at the very heart of Britians major cities. 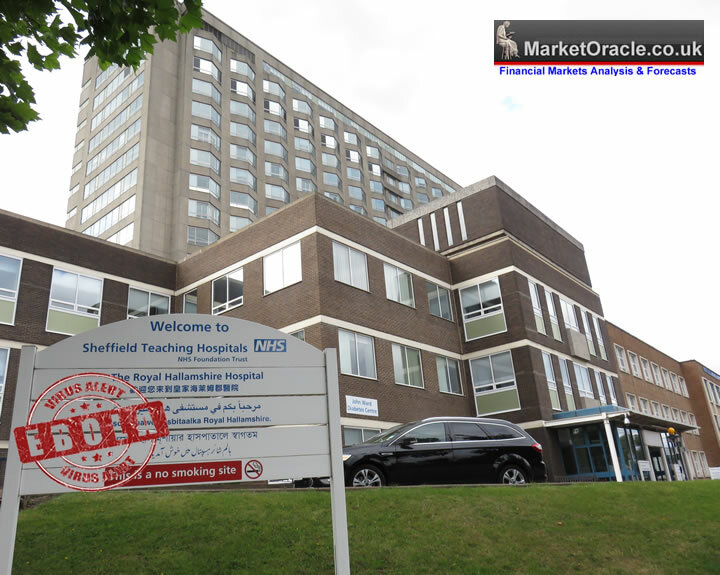 As an example Sheffield's Royal Hallamshire Hospital has been effectively designated as the regions first hospital to act as source for infection of the cities 550k population. If Spain’s best quarantine and healthcare facilities were unable to contain the virus then what hope is there for the likes of Sheffield's Royal Hallamshire Hospital that already has a poor record for hygiene as evidenced by the fact that each year many patients tend to contract the winter vomiting Norovirus which sows the seeds for a truly monumental disastrous outcome should any Ebola infected patients actually arrive at the Royal Hallamshire's isolation rooms. The people of Britain well understand that the myth of the NHS competency fails at least 1/3rd of the time when the NHS only tends to go through the motions of providing a health service which whilst most of the time the consequences for lack of consistency in competency is only to the detriment of the patient, however as we are witnessing in Spain that Ebola is completely unforgiving where any lack of competency that can result in a disastrous outcome. Therefore expect widespread panic amongst Sheffielder's as soon as news emerges of the Royal Hallamshire housing its first Ebola patients that will result in many cancelled appointments and demands for patients to be treated at other hospitals as Sheffield's Royal Hallamshire Hospital effectively becomes a no go zone as the city dreads hearing the inevitable news that the virus has escaped the isolation rooms which will happen even more easily than it has from Spain's state of the art facilities. And following news of the inevitable lack of competence in the hospitals acting as a disbursal point for the deadly virus than so will major cities such as Sheffield overnight become ghost towns as fear grips the population with those forced to venture out donning face masks to reduce the risks of exposure to the virus, no matter how reassuring the health officials are in their official statements for they will already have already disastrously failed the people of the city resulting in parents too afraid to send their children to school or even venture into work as the cities economy grinds to a halt as people keep themselves away from potential infections. Resulting in a landscape that resembles something out of a Stephen King novel where the only signs of life in public spaces would be black crows. The bottom-line is that major outbreaks in countries such as the UK and Britain are INEVITABLE because our Border agencies and national health services are just not competent enough in preventing it given the bio-terror threat, therefore we have a short window of opportunity to put all efforts into developing a vaccine in enough quantities to make a difference, else come January the body bags will start piling high in western nations as the virus goes viral! Literally out of control world wide with the only thing that would prevent future deaths would be a vaccine. Expect further Ebola fallout to hit the travel, holiday and hotels sectors ahead of the wider market as it attempts to discount the future which does not look good given the bio-terror risk that has not even been acknowledged by the likes of the broadcast media in the UK that risks a 9/11 type market reaction and resulting government emergency reaction such as grounding of all flights in an attempt to contain outbreaks. 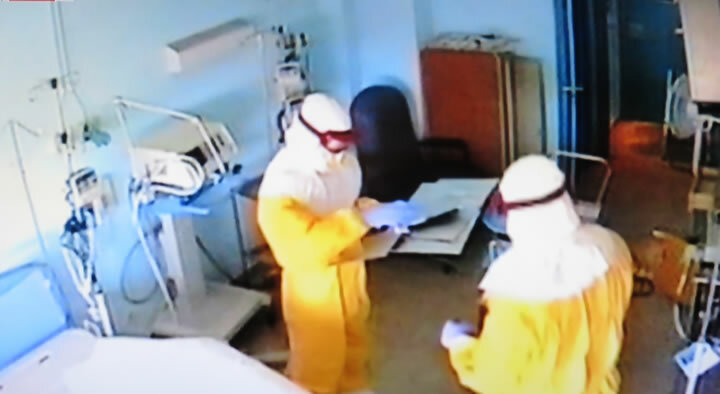 Therefore increasingly expect stock market flash crash days in the wake of breaking news of inevitable outbreaks as illustrated by the most recent news that containment of Thomas Duncan in the U.S. has failed or even worse Ebola bio-attacks. Your analyst fearing a perfect storm of incompetent politicians, officials, military complex, healthcare services and hundreds of angry suicidal jihadists all contributing towards an global pandemic that we have not seen the likes of for many centuries! The Ebola Apocalypse Plague. In terms of stock market trend this suggests that initial outbreaks will have little effect on the stock market, but rather it will be when the situation really starts to get out of control come January 2015, therefore January onwards I expect the stock market to be increasingly infected by what looks set to be out of control Ebola outbreaks. However, on the plus side where stock investors are concerned are a number of biotech stocks in a race to deliver an Ebola cure that I am sure may of the worlds governments will be forced to stockpile at great expense. There are several contenders such as ZMapp which cured the two U.S. healthcare workers. However the problem is in gearing up production of these potential vaccines to the quantities that governments will be demanding are well over a year away. With statements out of the Fed indicating that QE is coming to an end and markets increasingly focused on the prospects for rising interests where the consensus view is that rising interest rates will be bad news for the stock market. However, leaving aside that I am skeptical that after everything that the Fed has thrown at inflating stock prices that they would now allow the market to plummet like a stone, the facts are that the early years of a rate hiking cycle tend to be BULLISH for stock prices, for the interest rate rises tend to take place in a climate of economic strength NOT weakness. Instead it is interest rate CUTS that bulls need to fear for they signal weakness ahead as was the case during 2008 and into mid 2009. The Dow has fallen to the 200day moving average as the target for normal corrections that usually results in a resumption of the bull market. However, this time round as is usually the case for October, the Dow looks set to deepen its correction which implies a break of the MA and a trend towards at least 16,000. ELLIOTT WAVES - Where EWT is concerned I like to keep things simple, none of this double zig zag nonsense and its like but a simple 5 or 7 wave impulse advance followed by an ABC correction. The Dow should be in and is acting as it is in an significant ABC correction of which the current wave down is A that should shortly terminate followed by a B wave corrective rally before a final C wave decline. This suggests that the Dow is about a month away from making a low so probably around Mid November. Price wise the corrective rally should target 16,900k followed by a C wave of approx 800 near to the August low of 16,300 for a potential double bottom price pattern. The Dow's upper and lower channels have managed to contain the Dow's price action for the past 12 months, where the Dow repeatedly targets highs at the top of the central channel. Current price action saw the Dow fail to reach the central channel high in September before retreating to target the lower channel support which the Dow is now expected to bounce from. Normal expectations would be for a rally all the way to towards the central channel top at around 17,600, but it is increasingly looking unlikely that the Dow will even make it to the central lower channel before reversing which would be a strong indicator that the Dow looks set to break the lower channel support that would target the August low. Therefore channel analysis is looking significantly bearish for the Dow as it looks set to break out of a 1 year trading channel which implies greater volatility going forward and most probably the Dow will break the August 16,300 low. The stocks bull market remains in tact as the Dow continues to put in new highs with higher lows. The last significant low is 16,330 and the last high is 17,350. The Dow has breached trend-line support which means the Dow is now targeting the 16,330 low after which there are a string of supports along previous highs and lows at 16k and then the next major support comes in at 15,350. Whilst on the upside, there is heavy resistance from 16,950 to 17,160, a break of which would target a new all time high. Current price action implies an immediate term rally will find it very difficult to break above overhead resistance from 16,950 and the most probable outcome is for the Dow to target 16k. PRICE TARGETS - Upside price targets are 16,950 to 17,100. Downside are 16,350, 16,000 and then 15,350. Therefore if 16k breaks then the Dow could quickly plunge to 15,350. Therefore the Dow currently has heavy resistance overhead and support at 16k and then 15,350, with the risks to the downside. MACD - The MACD has been successfully unwinding its overbought state since Mid September. However, it has further to go to reach an oversold state, therefore implies a couple more weeks of weakness to prime the market for a Santa rally. The VIX has finally spiked higher and thus is acting to dissipate the extreme level of investor complacency. Therefore the correction is GOOD for it acts to shake out the weak longs. Technically the VIX has achieved its minimum target, however it is correcting an extreme of investor complacency so should spend some time at above 20 and probably see several spikes far higher to above 30. So in terms of what the VIX is saying the correction job is about half done. Another point is that persistently high volatility means to expect greater moves than we have gotten used to during 2014. SEASONAL ANALYSIS - Back in early June I warned that the real correction won't begin until the seasonal weakest months of the year - Sept / October and so the seasonal trend is coming to pass. It appears each year analysts tend to forget that this is the time of the year to expect severe corrections! The seasonal pattern is for the Dow to make a low in either late Sept or Late October and then rally all the way into the end of the year. This years observed pattern is clearly pointing towards a late October low followed by the traditional Santa rally into end 2014. Furthermore seasonal trends tend to be supportive of a bull market into early May of 2015. INTERMARKETS ANALYSIS - CRUDE OIL - A falling crude oil price is usually bullish for the stock market for it reduces the cost of doing business and thus improves the prospects for future corporate profits. INTERMARKETS ANALYSIS - STRONG U.S. DOLLAR - The US Dollar has been surprisingly strong of late which is supportive of stock prices for it means foreigners are buying dollars to invest in the United States which is economic growth positive, after-all dollar strength cannot be put down to interest rate differentials between near zero and near zero etc. How long dollar strength can continue for is difficult to gauge without an in-depth analysis, but I don't see it as sustainable because the US is still a money / debt printing machine and so the USD will probably give up most of its gains of the past 3 months over the next 3 months. The Dow peaked at 17,350 and currently stands at 16,544, down just 4.6%, which is just not going to be enough to fullfill the requirements for this correction as a strong bull market correction could run to between 15% to 20% down which suggests 14,750 to 13,880, well beyond the scope of what this analysis is suggesting which is calescing around the 16k low that is just 7.8% off the last high. Whilst the next support at 15,350 comes in at -11.5%. So the question I am pondering is where does the Dow make a low at 16,000, 15,350 or will it continue down to 13.5k? It is a tough call, but I am going to go with a continuing volaile downtrend towards 15,350 which suggests that the Dow is going to need more time to put in the low so rather than a late October bottom we are probably going to continue to see the Dow grinding lower into at least mid November. Following which we can expect a Santa rally that would target the series of resistance all the way to the last all time high of 17,350 into the end of this year, by which time the New Year Ebola hangover will become clearer and start having greater impact on the stock market which suggests early 2015 weakness. My final conclusion is for the Dow to continue its volatile trend lower into Mid November towards 15,350 , probably bottoming out around 15,500. To be followed by a rally to 17,100 by the end of this year, following which I expect a weak January with Dow probably ending the month below 16,500 having traded down to 16,350. It would not surprise me if the Dow slices through support at 15,350, and spikes to under 14,000! Which technically would still mean that the bull market remains intact, though damaged and would find it a tough grind to get back to anywhere near its preceding all time high. My next analysis will probably take an in-depth look at Gold so ensure you remain subscribed to my always free newsletter for ongoing analysis and detailed trend forecasts across multiple markets. Any economic weakness, or weakness in stocks, linked with the Ebola crisis will Iam sure be used as an excuse to ramp back up with the QE, even if they do not call it that. I think it is clear they cannot stop, so they will find some excuse. Re U.S. stocks and the Dollar, Iam reading a lot about international capital flows and it would appear that far from a Dollar collapse the Dollar is rallying as money flows out of other places. To assume some of this money must surely find its way into stocks as a way of finding some yield seems reasonable. Will Peter Schiff and others be caught on the wrong side of a Dollar/US stocks rally? It looks like the Dollar will be the last to fall, not the first, as the Dollar collapse crowd have been predicting. Some FT articles talk about the indexes being expensive by historical standards. Is that why we are seeing a correction? In addition, fears of interest rate rises following the FED's QE tapering and 10 yr forward inflation projections being below 2% in the US are all bearing down on the markets. So what is it that is driving this mega bull market you call? The driver is the INFLATION MEGA-TREND. There is no deflation, nor has been bar for about 6 months into Q1 2009.